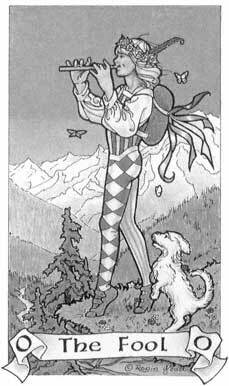 This card shows a young blond man dressed as a harlequin. He is playing the flute, and dancing near the edge of a precipice. Near his feet is a little dog. The meaning of this card is thoughtless innocence, and lighthearted folly. A lack of discipline. A lack of experience that can be dangerous. Great freedom, although with a connotation of foolishness. Idealistic youth, creativity. Seeing only the goal, and not possible difficulties along the way. I dressed the fool as a harlequin to show that he is a lover, with sharp wits, although he may also be somewhat of a buffoon, and liable to be hurt in the end. I gave him a white shirt to show his purity. His vest is yellow and blue to show sun and shadow, light and dark. His moods may be mercurial, and vary between these extremes at the drop of a hat. He wears red and white on his left leg for the Lord and purity. Red is often a color associated with the Lord, the God of the Hunt, and squares are also often symbolic of masculinity or rigidity. On his right leg are the green and white stripes of the Lady. Green and white are her colors for a good part of the year. But usually the right, active side is seen as masculine, and the left, intuitive side as feminine. He has them reversed to show that although he is aware of the forms, he doesn't really understand. Or perhaps he flaunts the convention in an act of youthful rebellion, to assert his freedom and independence! He dances, carefree, to the sounds of a pipe. In many decks, he is carrying a staff which symbolizes the wand of will and life (we'll get more into that in the chapter about the suit of Wands.) In my deck, I decided to transform the wand into a pipe, because I see him as playing with his will and life; having fun, and making pretty tunes with them, but in a larger sense doing just as he wants with them, with little regard for the consequences. Far from a staff to steady his steps, he has made them into a flute to dance to! And dancing on the edge is very dangerous. He wears the white roses of freedom in a wreath around his head. There are five of them, to symbolize the five elements; earth, air, fire, water and spirit. He knows of all of them, which gives him freedom in each. But the knowledge is still only at his head level. It has not penetrated to his heart, and he isn't paying attention to any of it! He wears a pack on his back, strapped on with the white ribbons of guilelessness. In it he carries all the things he needs to get along in the world. But they are strapped down behind him, and not really accessible. I gave him five ribbons for the five senses. They are what he has bound his life up with. When he reaches for something he needs, he hits them first, and is usually distracted by their beauty. He dances on bright spring grass, to show this is a youthful thing. The grass is strewn with pairs of red and white flowers for fearlessness and innocence. His eyes are on the distant vista of the mountains, which stand for knowledge and enlightenment. That may be a good thing, but in this case it means that he is completely unaware that he is about to dance right off the edge of a cliff! A little white dog, which symbolizes his friends, or his own unconscious mind, is trying desperately to warn him of the danger. But so far he is not paying any attention. Sometimes, when this card comes up in a reading, the little dog looks like it's just dancing along with him, aware of the brink, but unwilling to disturb it's master. In that case, I read it as people who are so enamored of his charisma that they are sure that he does really know what he is doing, all appearances to the contrary notwithstanding. If he is going to go over, then that must be the right thing to do, and they'll go right over with him! Below him is the valley which symbolizes the deeper parts of his own soul, with the stream of his unconscious running through and watering it. In a very real way, it's the depths within himself that he is about to tumble into. Three trees grow up from the valley to the level where he walks. These symbolize his body, mind, and soul. They are the parts of which he is made, which rise from his inner self until they are seen by all, although their roots remain hidden. As he dances, three butterflies flit around him. Butterflies in the Tarot stand for transformation. If he doesn't watch out, he is going to have a transformative event! (Oh please, Gods, not another learning experience!) I gave him three to show the future, which is rosy; the present, which is a blank sheet; and the past, which is golden. He is facing the future, but the past and present are both behind him, and he isn't looking at them at all. In other words, he is paying very little attention to where he is now. The sun shines brightly on him, and there are no clouds in his sky.